For Dayanita Singh photography is simply a starting point rather than an end in itself. Her work constantly pushes the boundaries of the form, examining how we might exhibit and thereby think about the photographic image. Shown alongside this is a series of colour photographs entitled Time Measures. These particular images are the latest to have emerged from Singh’s long-term interest in the paper archive. 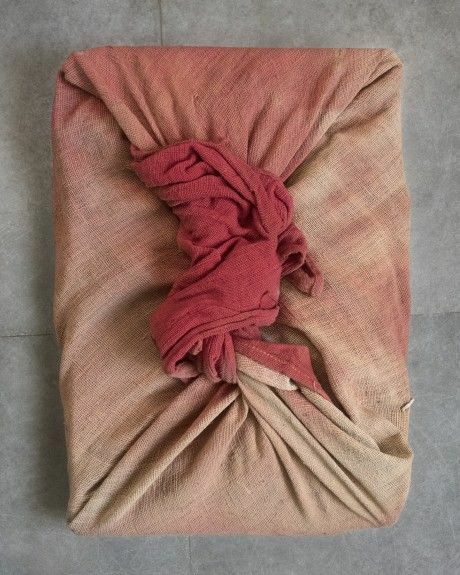 She discovered these bundles of fabric-wrapped documents in an archive in India. The bundles themselves are of indeterminate age, their contents are unknown. At some stage these papers were wrapped in red cotton fabric, placed on shelves and then forgotten. Every bundle is tied by a different hand with a different knot to seal it. Over the years these stacked bundles have faded and become compressed. The knots, in combination with the forms and faded colours, gives them very tangible personalities, turning each image into a singular portrait. Dayanita Singh was born in 1961. She studied Visual Communication at the National Institute of Design in Ahmedabad and Photojournalism and Documentary Photography at the International Center of Photography in New York. Recent solo exhibitions include: Museum of Machines: Photographs, Projections, Volumes, MAST, Bologna, 2016, Conversation Chambers: Museum Bhavan, Kiran Nadar Museum of Art, Delhi, 2015, Go Away Closer, MMK, Frankfurt and Hayward Touring, 2014, and the German Pavilion at the Biennale di Venezia, 2013. In December 2016 she will have a solo exhibition at the Bhau Daji Lad Museum in Mumbai. Dayanita Singh lives and works in New Delhi.